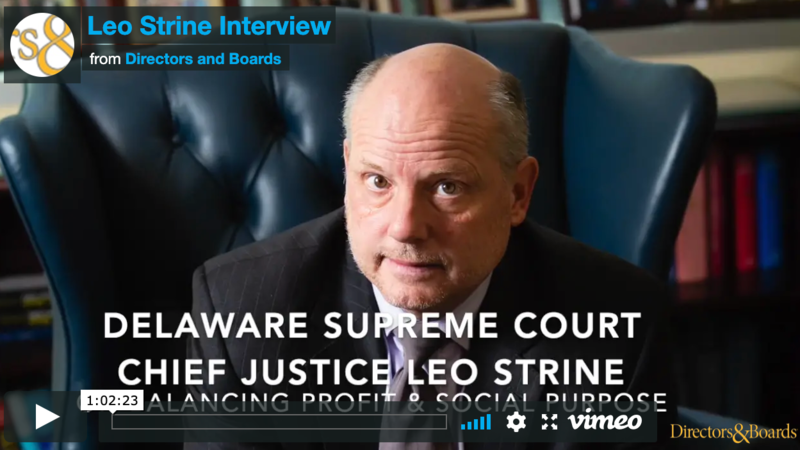 In this exclusive video interview with Delaware Supreme Court Chief Justice Strine, he shares his thoughts on what directors can do when it comes to environmental, social and governance (ESG) initiatives; his take on Elizabeth Warren’s Accountable Capitalism Act; and he discusses how the movement to have more independent directors in the boardroom may have ended up undermining the gain-sharing between employees and top management. To view the video, please complete this form. You will automatically be signed up for Directors & Boards’ newsletter focused on all things corporate governance. You can opt out at any time. If you are already receiving our newsletter, we thank you! If so, which boards do you serve on?